As of January 2014, some 76% of American adults ages 18 and older said that they read at least one book in the past year. Almost seven in ten adults (69%) read a book in print in the past 12 months, while 28% read an e-book, and 14% listened to an audiobook. Women are more likely than men to have read a book in the previous 12 months, and those with higher levels of income and education are more likely to have done so as well. In addition, blacks are more likely to have read a book than Hispanics. There were no significant differences by age group for rates of reading overall. Some of these differences are even more pronounced if we narrow the focus to look only at those who read a book in the past year. Among these recent readers, young adults caught up to those in their thirties and forties in terms of overall e-reading: Almost half (47%) of those under 30 read an e-book in 2013, as did 42% of those ages 30-49. 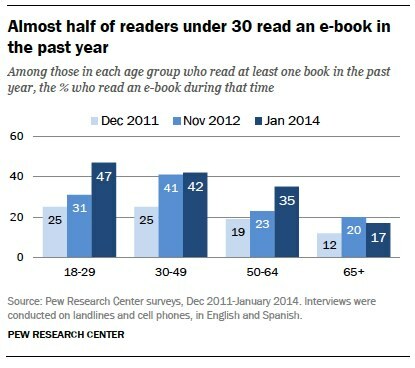 E-reading also rose among readers ages 50-64, from 23% in November 2012 to 35% in January 2014. 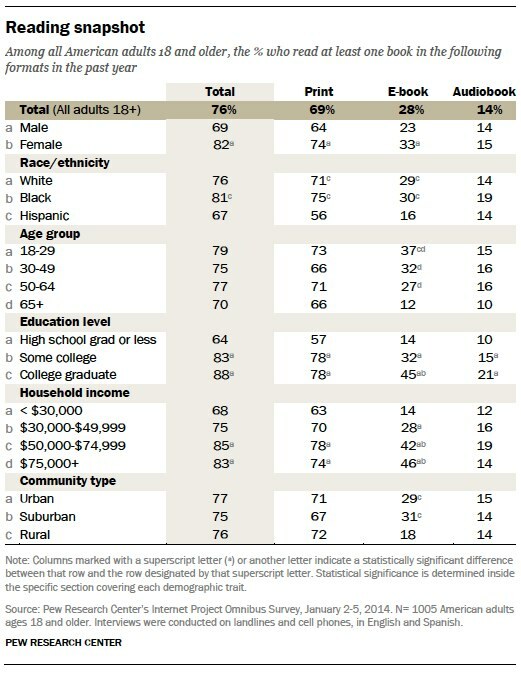 However, the e-reading rate among readers ages 65 and older remains around 17%. Younger e-book readers were especially likely to access e-books on cell phones or computers, while older adults were more likely to use dedicated e-readers. Only 23% of e-book readers overall read on a tablet. However, as tablet and e-reader ownership levels have risen over the past few years, these devices have become more prominent in the e-reading landscape. A majority of e-book readers say they read e-books on an e-reader or tablet, and fewer do any e-book reading on a desktop or laptop computer. About a third (32%) of e-book readers still say they sometimes read e-books on their cell phone, reflecting both the ubiquity of mobile phones and the convenience of these phones as supplementary reading devices. Though personal computers and cell phones may be used for a wide array of activities (including but not necessarily e-reading), most people who read e-books and own a tablet or e-reader consume e-books on those devices. E-book readers who own dedicated e-reading devices also tend to read e-books on them more frequently, while computers or cell phones are used less often, if ever. 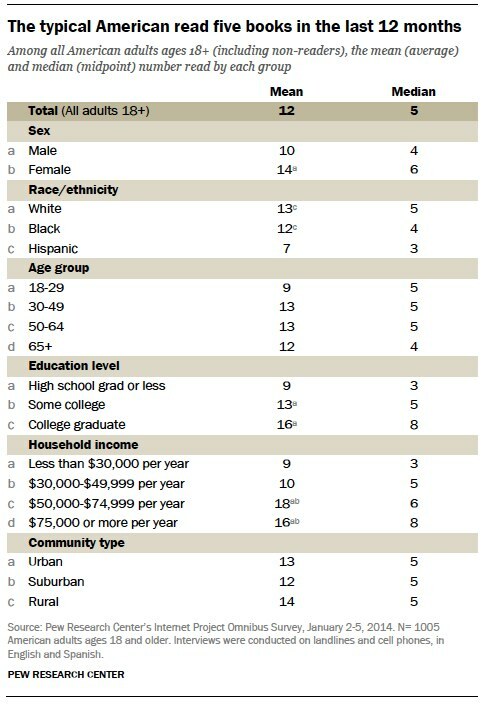 As noted earlier, 42% of adults own a tablet. Most e-book readers who own tablets say they read e-books on that device (78%), with 44% saying they do so at least weekly. Male e-book readers who own tablets are more likely than women to read e-books on these devices (88% vs 72%). 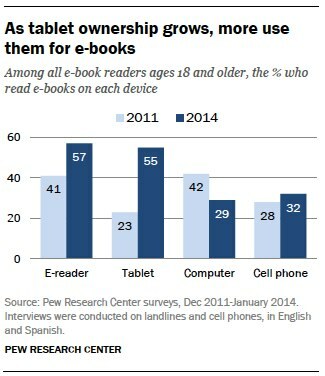 Some 32% of adults own an e-reader like a Kindle or Nook. Unsurprisingly, most e-book readers who own dedicated e-reading devices such as Kindles or Nooks say they do read e-books on that device (87% say they do this, and 53% do so at least weekly.) Women are more likely than men to have read a book on their e-readers in the past year: 77% of men in this group read e-books on those devices, compared with 93% of women. Adults who own e-readers like Kindles or Nooks read e-books more frequently than those who only own other devices (like tablets or cell phones). However, it is difficult to know whether that is because dedicated e-readers encourage more reading or because avid readers are more likely to purchase e-reading devices. 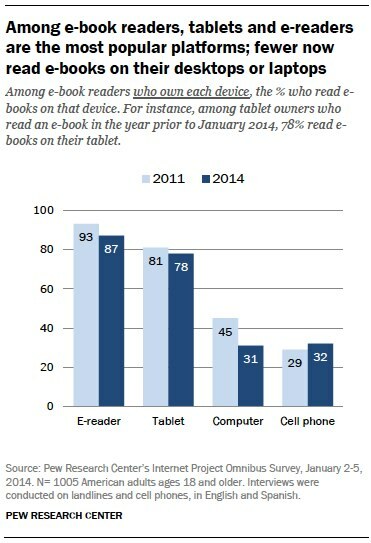 Though 75% of adults own a desktop or laptop computer, few use them for e-book reading. Among desktop or laptop owners who read an e-book in the past year, 31% say they read e-books on their computer (down from 45% in 2011); only 9% say they do so at least weekly. Some 92% of adults own a cell phone, and a majority a smartphone. Though only about a third (32%) of cell phone owners overall use them for e-book reading, the overall proportion of e-book readers who use their cell phones to read those e-books has held fairly steady since 2011. Few do so regularly—just 12% saying use their phone for e-book reading at least weekly.